Hate that evening traffic jam? 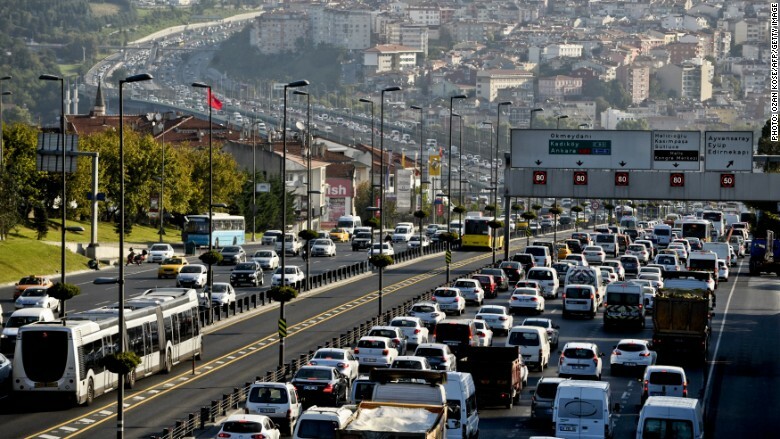 Spare a thought for commuters in Istanbul, who have to put up with the worst congestion in the world. Istanbul, with its bridges connecting Asia and Europe, has the worst traffic at peak evening hours, and overall, in the world. Commuters there spend a whopping 125 hours stuck in traffic every year -- a number based on two 30-minute commutes per working day. GPS manufacturer TomTom says a journey that would normally take 30 minutes in free-flowing traffic takes more than an hour during evening peak times. Source: The TomTom Traffic Index 2015. The TomTom index is based on real time data from vehicles driving across each city's entire road network. It contains over 9 trillion data measurements. The index shows how long it would take to complete a congestion-free journey of 30 minutes during periods of average, and peak, traffic. Self driving car starts cross-country trip, but stops for lunch at In-N-Out Burger!